differences between transpiration and guttation; significance of transpiration. Stomatal mechanism - K + transport mechanism. Mechanism of ascent of sap by cohesion – tension and transpiration pull theory. Process of adsorption of water by the particles of solid substances without forming a solution. Imbibant or adsorbant- Substance that imbibes water. Imbibition and adsorption.- water molecules get tightly held through the process of capillarity and get immobilized. Heat of hydration.- After adsorption water molecules immobilized and lose their kinetic energy in the form of heat. Imbibition pressure-Imbibition increase the volume of imbibant due to which tremendous pressure is created. Water potential gradient between adsorbent substance and liquid imbibed. Affinity between adsorbant and the liquid. Imbibition is the initial step in seed germination. Imbibition causes swelling of seeds and results in the breaking of testa. Imbibition is dominant in the initial stage of water absorption by roots. The water moves into ovules which are ripening into seeds by imbibition. Movement of molecules of a substance from the region of higher concentration to the region of lower concentration, due to their kinetic energy,until equilibrium is attained. Volatile aromatic compounds from flowers help in pollination. The pressure exerted by diffusing particles is called diffusion pressure. Diffusion pressure is directly proportional to the concentration of the diffusing particles. The diffusion pressure of pure solvent is always greater than the diffusion pressure of solutions. A pure solvent has maximum diffusion pressure. 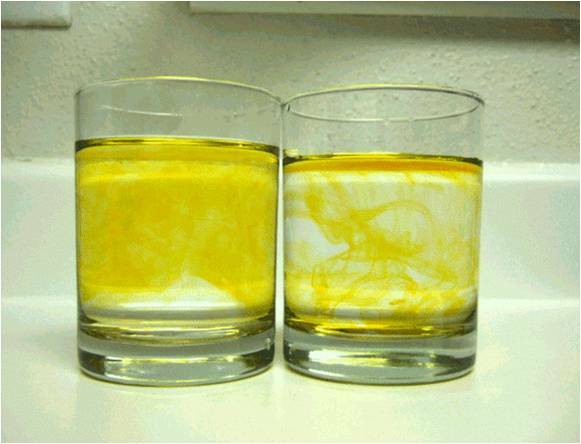 By adding solute particles in solvent its diffusion pressure is lowered. This pressure by which diffusion pressure of a solution is lower than that of its solvent is called diffusion pressure deficit. "The amount by which diffusion pressure of a solution is lower than that of its pure solvent is known as diffusion pressure deficit." It was described as suction pressure by Renner (1915). But the recent trend is to use the term water potential to explain diffusion of water. Osmosis is a special type of diffusion of liquids. 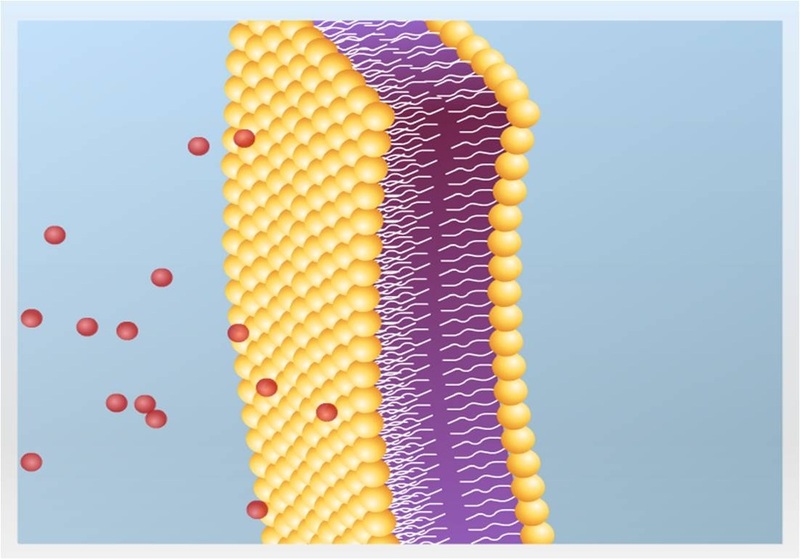 The ability of the entry and exit of water into and out of the plant cells is due to a phenomenon called permeability of the plasma membrane. The process of osmosis may be demonstrated by the simple potato osmoscope. Demonstration of osmosis in a living system can be done using the potato osmoscope. A potato is peeled and one side is flattened which serves as the base. 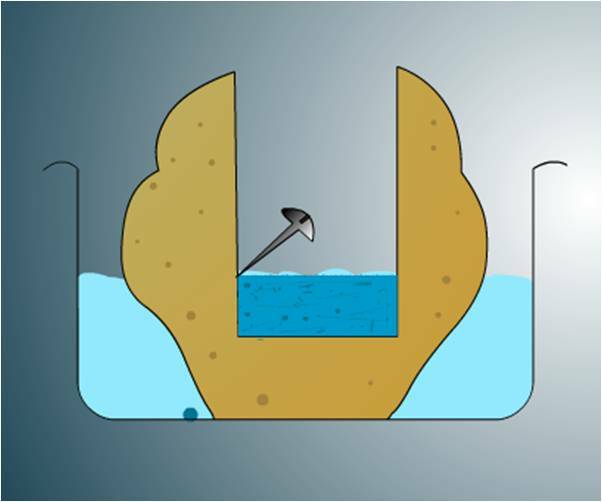 A cavity is made in the potato and is filled with concentrated sugar solution and a pin mark is made to indicate the initial level. This potato is then placed in a beaker containing coloured water for some time. 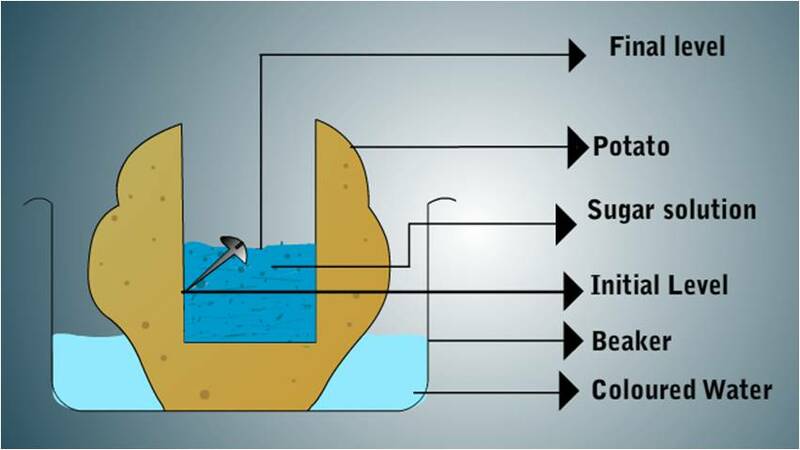 It is observed that the sugar solution in the cavity of the potato becomes coloured and level rises. This proves the entry of water into the sugar solution through the potato tissues which serve as the selectively permeable membrane. When a cell is placed in a solution of higher concentration than that inside its vacuole, water diffuse out of the cell. When a cell is placed in a solution of lower concentration than that inside its vacuole, water enters the cell. When a plant cell is placed in hypertonic solution, the process of exosmosis starts and water from the cell sap diffuses out into the solution of external medium.This causes a reduction in the tension of the cell wall and brings about the contraction of protoplasm due to the continuous loss of water. The protoplasm becomes rounded in shape due to contraction and such a cell is said to be plasmolysed and the phenomenon is referred to as plasmolysis. 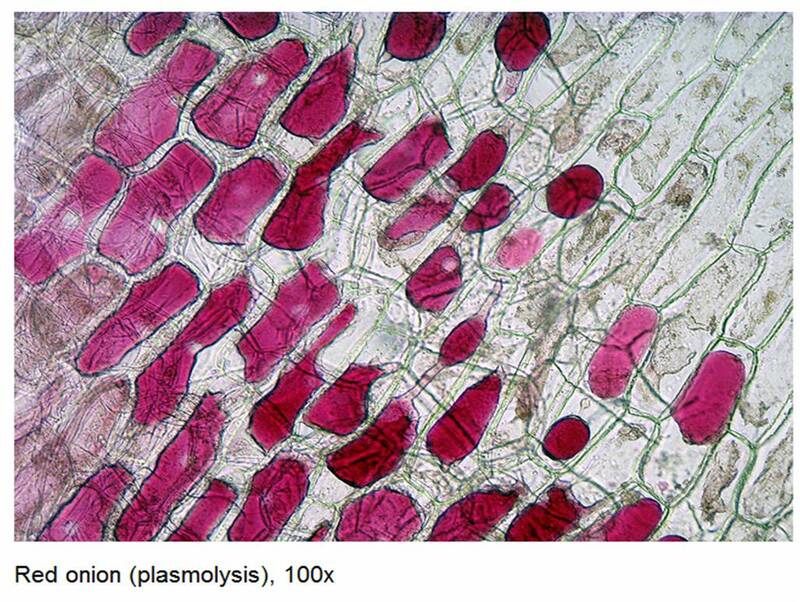 The initial stage of plasmolysis where the protoplasm just starts leaving the cell wall is called incipient plasmolysis. When a completely plasmolysed cell is again placed in water or a hypotonic solution, endosmosis takes place and the protoplasm regains its original state and shape. i.e., the cell becomes fully turgid. This phenomenon is the reverse of plasmolysis and is called deplasmolysis. Helps to understand the living nature of a cell. 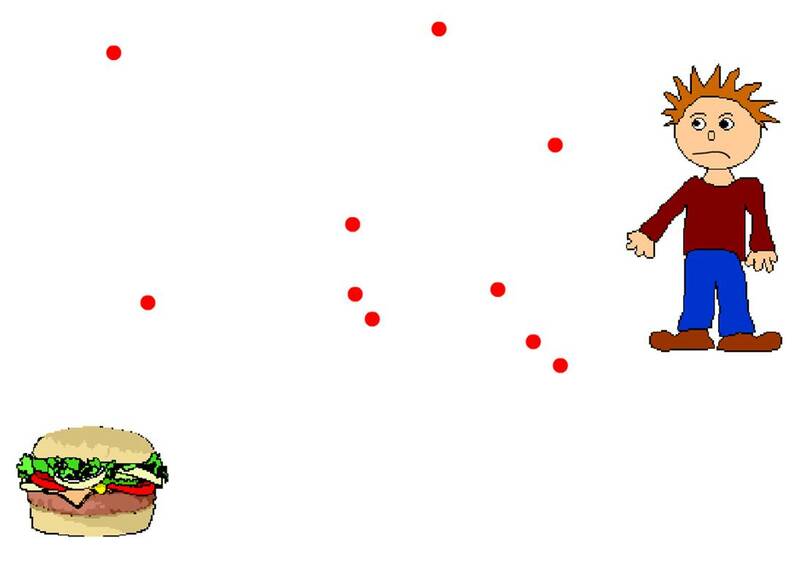 Determines osmotic pressure of cell. Used to prove the permeability of cell wall and selectively permeable natureof plasma membrane. Helps to preserve meat, jellies and used in pickling as their salting kills bacteria by plasmolysis. 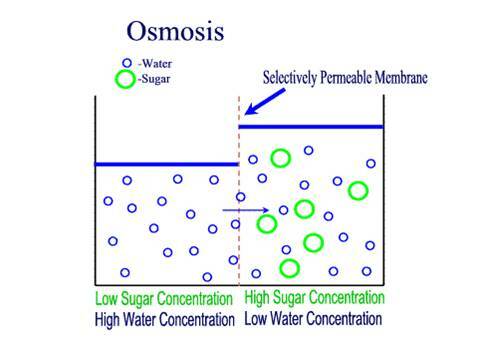 When a cell or a solution is separated by semipermeable membrane from water, pure water tends to enter the solution by osmosis. Now the pressure required to prevent the osmotic entry of water into solution. 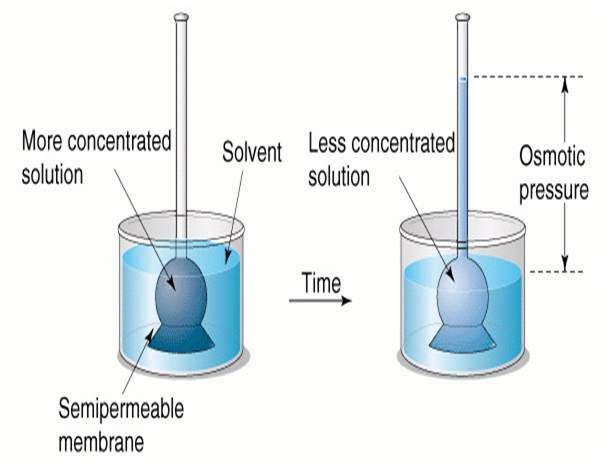 Osmotic pressure of a solution is the pressure which must be applied to it in order to prevent the passage of solvent due to osmosis. 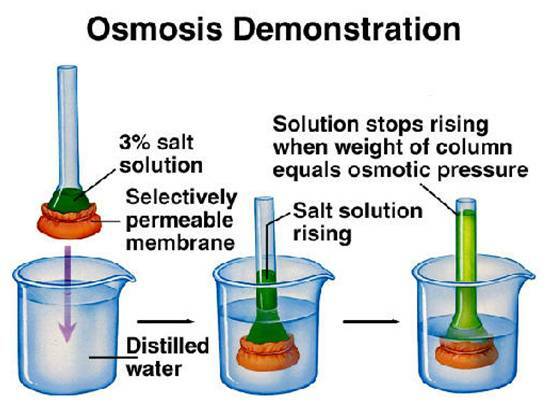 In other words, it is that pressure which is needed to check the process of osmosis. 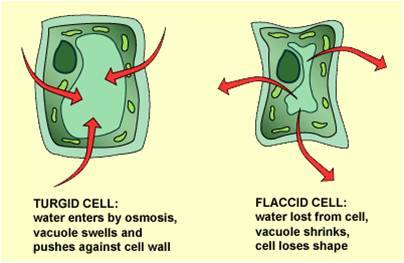 When a plant cell is placed in water, it enters the cell by osmosis. This results in an hydrostatic pressure called the turgor pressure (TP) which exerts on the cell wall, membrane and other structure contains it . This pressure responsible for pressing the plasma membrane against cell wall is called turgor pressure. "Turgor pressure may also be defined as the hydrostatic pressure developed inside the cell on the cell wall due to endosmosis." It is essential for plants to live and grow. Provide mechanical support to non woody parts of the plants. Loss of turgidity leads to wilting of leaves and drooping of shoots. Opening and closing of stomata are regulated by the turgidity of the guard cells. As a result of turgor pressure on the cell wall, the rigid cell wall exerts an equal pressure in the opposite direction called wall pressure. Under these conditions, the plant cell is said to be turgid. When wall pressure becomes equal to turgor pressure, entry of water into the cell stops. In a fully turgid cell. The difference in the free energy of water molecules in the solution and that of pure water at the same temperature and pressure. Water potential is denoted by the Greek letter psi (Ψ) and is measured in bars. Thus, water potential is the chemical potential of water. By convention the water potential of pure water is given the value ZERO. Because pure water has the highest concentration of water molecules, and thus the highest water potential, the water potential of all other solutions must be lower than zero i.e. negative. When a typical plant cell containing cell wall, vacuole and cytoplasm is placed in a medium containing pure water, there are a number of factors which determine the water potential of the cell sap. It is a component of water potential which is also called osmotic potential . It represents the amount of solute present and is denoted as ΨS. The osmotic potential of pure water is zero and gets lowered when solute molecules are added to it. Solute potential is the potential of solution to gain water. Water moves from the solution having low OP (more negative) to high OP. 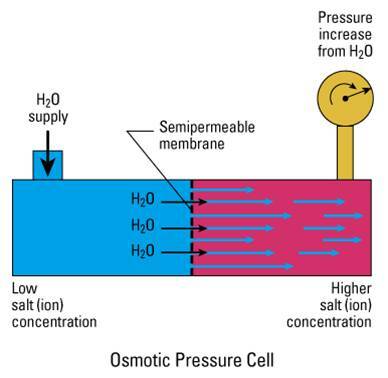 The component of water potential due to the hydrostatic pressure that is exerted on water in a cell. Pressure potential which is denoted as Ψp is equivalent to either the wall pressure or turgor pressure. In turgid plant cells it usually has a positive value. In xylem cells there is a negative pressure potential, or tension, as a result of transpiration. Rain is the principal source of water for the soil. Gravitational or free water- Water which flows down due to the force of gravity is known as gravitational water. However, it is a big soil water reservoir and is trapped out through tube wells. Capillary water: A certain amount of rain water is retained within the intercellular spaces of the soil particles in the form of a capillary network. It is called capillary water and is used by the plants. Hygroscopic water :Some water molecules form a thin sheet of water around soil particles. It is called hygroscopic water (water of imbibition). Combined water: The water, which is bound up in chemicals is called combined water or crystalline water. (e.g. MgSo4.7H2O). Holard –total amount of water present in the soil. Chesard- amount of water available to plants. Echard- amount of water cannot be absorbed by plants. 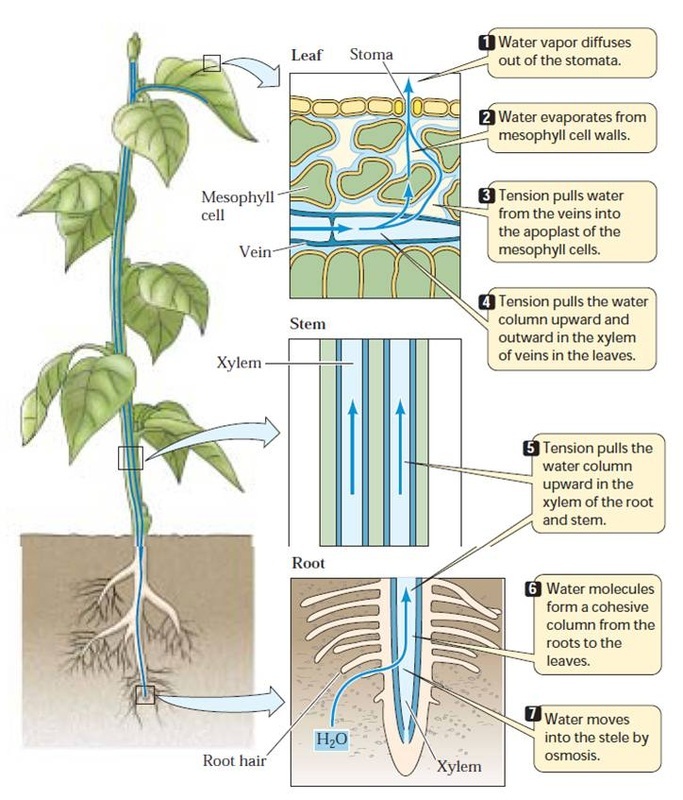 Absorption of water occurs in plants through roots. The zone of water absorption in root is about 20 - 200mm from the root tip and this is the root hair zone. The ultimate units of water absorption are the root hairs. Absorption of water still occurs when the concentration of cell sap in the root hair is lower than that of the soil water. (Against the concentration gradient). The forces responsible for absorption of water into the roots originate in the cells of transpiring shoots rather than in roots itself. (DPD). 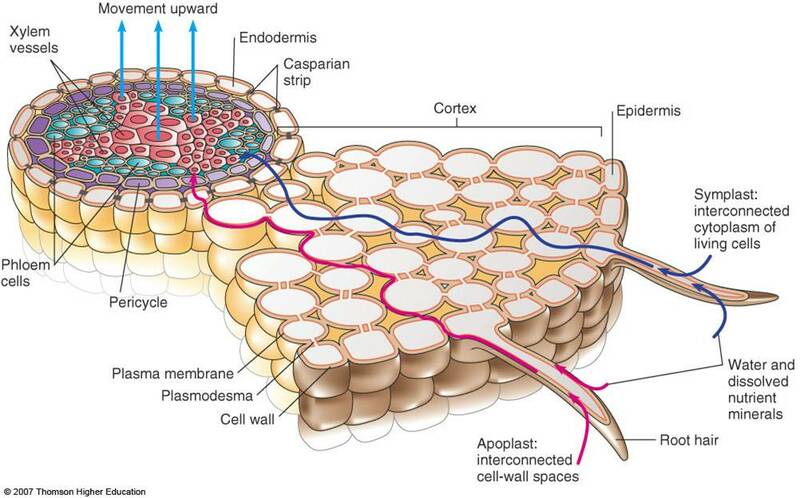 From the root hair water reaches the cells of the rhizodermis, then through the cortical layers the water reaches the passage cells of the endodermis which are opposite to the protoxylem points. The water then passes through the parenchymatous pericycle and reaches the protoxylem. In this pathway the movement of water occurs exclusively through cell wall and extra cellular spaces without the involvement of any membranes. Majority of the amount of water goes through the apoplast pathway. The cortex of the root does not oppose such movement of the water. The movement of water molecules is from cell to cell through the plasmodesmata. Less amount of water goes through the apoplast pathway. The cortex of the root oppose such movement of the water. Definition: The upward movement of water and mineral salts in xylem vessels through the roots to aerial parts of the plants is known as ascent of sap. A number of theories have been given to explain about the mechanism of ascent of sap. According to this theory the pumping of water takes place upwards due to the vital activities of xylem parenchyma and xylem rays. According to this theory water is pumped up due to the contraction and expansion of innermost cortical cells which creates a pulsation causing upward movement of water. The pressure exerted by the root tissues that would force liquid up the xylem. The basis for root pressure is a higher solute concentration, and accordingly a more negative water potential, in the xylem sap than in the soil solution. This water potential draws water into the stele, once there, the water has nowhere to go but up, so it rises in the vessels and tracheids. The best evidence of root pressure is guttation and bleeding. A process inn which liquid water is forced out through openings at the margins of leaves (Hydathodes) due to root pressure. plentiful water in the soil, which occur most commonly at night. Exudation of sap from injured parts of the plants is called bleeding. Examples: Exudation of milky latex from euphorbia, cut stumps of some plants, such as Coleus. 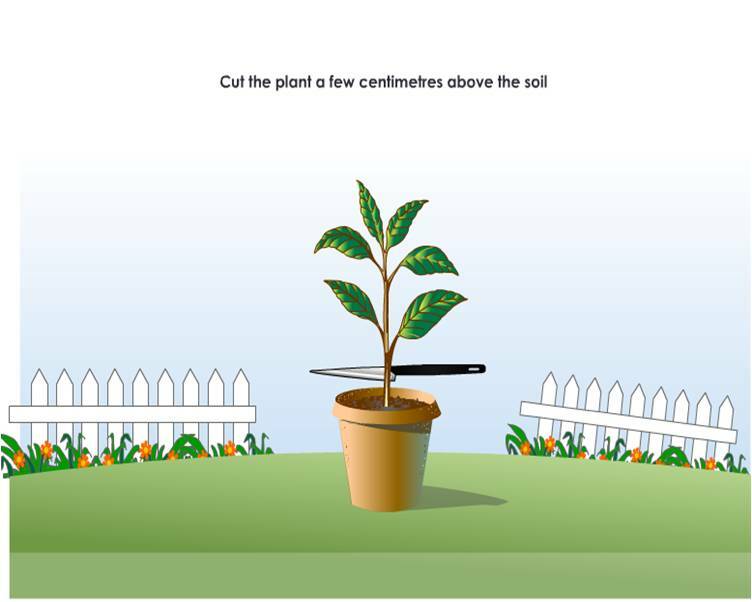 If a well watered plant is cut near its base, the xylem sap is seen to flow out through cut end with a pressure. Root pressure, however, cannot account for the ascent of sap in trees. Root pressure seldom exceeds 0.1–0.2 MPa (1–2 atmospheres). If root pressure were driving sap up the xylem, we would observe a positive pressure potential in the xylem. The most accepted theory of water movement through plants. Proposed by DIXON and JOLLY in 1894. Due to transpiration water lost in the form of vapour from the leaves. Due to water loss mesophyll cells becomes concentrated. These mesophyll cells draw water from adjoining mesophyll cells which in turn from xylem elements of leaf. Xylem filled with continuous water column from leaf to root due to cohesive force. A tension is generated at the top called transpiration pull. This tension transmitted downwards up to roots through stem. Due to which water moves upwards.